So, Ezekiel, George's son, is now a grown man, his apprenticeship to blacksmith Thomas Avery is finished and he's ready to strike out on his own. According to Joyce Pendery in her article on the Worthen Family, Ezekiel was friends with Samuel Foote, who married Hannah the daughter of Richard Currier. Ezekiel also married a Hannah, she was the daughter of George Martin and his first wife Hannah Unknown. They were married on 4 December 1661 in Salisbury. Hannah's mother died when she was 2-3 years old. She was raised by her step-mother Susanna North Martin. George Martin was also a blacksmith, it is not known when he came to the colony, but he was living is Salisbury by 1643. The father-in-laws of the two young men had lived in Salisbury, Mass, but by that time the town had grown beyond its boundaries and a new town of Amesbury was underway. In 1666 Amesbury was incorporated and all four men were listed as citizens of the new town. As with most men, Ezekiel became more active in the running of town as he grew older. By his forties he served on juries and took his turn as town constable. He took the Oath of Allegiance in 1677. Ezekiel bought and sold land for the remainder of his life. He also deeded land to his children. In 1667 Ezekiel was assigned his spot in the meeting house, next to his father in law, George Martin. During the church service the men sat on one side, the women on the other. Everyone had an assigned spot based on social standing in the community. The Deacons of the church sat beneath the Minister and faced the congregation. A "tithing man" walked around the building with a long stick, prodding people who appeared asleep. Apparently George Martin objected to the seat assigned to his wife, Susanna, possibly he felt that she she was slighted and should have been assigned a better seat. This was the beginning of a long series of skirmishes which would eventually end badly for Susanna Martin. 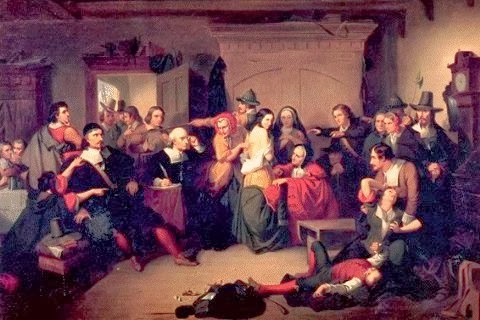 Susanna was first accused of witchcraft in 1669 by William Sargent, Jr. and his brother Thomas Sargent (both ancestors). Her husband in turn sued them for slander. Both cases went to court. Charges were dropped against Thomas Sargent, but William Jr. was found guilty and given a nominal penalty. Charges were also dropped against William Sargent Sr. but the court disagreed with this decision. The proceedings and outcome of the case against Susanna is unknown, the court records are lost. In October of 1669 George was sued by Christopher Bartlett because Susanna had called him a liar and a thief. Their son Richard Martin was also in court that year for assaulting and threatening his father, he was sentenced to be whipped. Obviously 1669 was not a good year for the Martins. Susanna's father Richard North died in 1668 and she and her sister Mary expected to have a large share in his estate. However his Widow Ursula produced what they considered a fake will which left almost all the estate to her. George, Susanna and Mary took Ursula to Court. Their lawsuit went back and forth several times but they finally lost in 1674, another blow for the family. Things seemed to settle down for a while. George, Susanna's husband, died in 1686, leaving his estate to her to manage. His death also left her to defend herself against any further charges, making her an easy target for unhappy neighbors. 1692 is the year that the witch trials in New England reached their zenith. The girls involved in the Salem Witch Trials spread their accusations to neighboring towns. No one, irrespective of position, whether high or low, was safe from the accusers. Eventually the girls accused Susanna once again of being a witch, with her past history, it's not a surprise. Luckily for her daughters, none of them were accused unlike other families where the females were all under suspicion. On 30 April 1692 a warrant was issued for Susanna's arrest. Her friend and neighbor Orlando Bagley, town constable, came to arrest her. After a preliminary hearing she spent time in prison. Her trial was held on June 26th, her neighbors came out in droves to spin wild stories of her guilt. Some of those neighbors are also ancestors. She was a tough woman who stood her ground, she refused to plead guilty and possibly save her life as others had done. Having been found guilty, Susanna Martin and four others were taken to Gallows Hill and hung on July 19, 1692. Only after the Salem accusers pointed their fingers at the very top of society, including the family of the above Cotton Mather, did the trials stop. In 1696 Rev. Mather issued a statement that the trials were a travesty and that innocent people lost their lives. In 1711 the General Court issued an apology and compensation for many of the survivors. According to Samuel Copp Worthen in his history of the Worthen family, Ezekiel left his Congregational Church after the witch trials and joined the Quaker Church. On at least two occasions he had possessions or animals confiscated to pay his rate for the Congregational Minister. Eventually the Quakers were allowed to opt out of the tax. Despite their trials Ezekiel and Hannah lived long prosperous lives. They had ten children, who all lived to adulthood. 1. Hannah, born April 21, 1663, married, December 5, 1684, Samuel Fowler. 3. Thomas, born October 31, 1667, married Hannah Annis. 5. Ezekiel, born May 18, 1672, married, December 26, 1704, Abigail Carter. 6. Margerite, born September 24, 1674, married George Weed. 7. Samuel, married, November 17, 1701, Deliverance Heath. 8. Dorothy, married, October 5, 1702, Joseph Hoyt. 9. Judith, married, February 19, 1707-08, Abraham Page. RIP Ezekiel wrote his will in 1715 and died the following year. Hannah, stayed in the family home for some years afterwards but eventually moved in with her daughter Hannah Fowler. She died in 1730. My name is Samuel C. Worthen and I am a descendant of Ezekiel. My branch of the family has always kept records and it has been interesting to see just how accurate they were. My question regards your statement about Ezekiel's trade. We have always known that he was apprenticed after the death of his mother, but have never been able to track the mysterious Thomas Abree/Avery. Thanks for getting back so quickly Jeanie. The only thing that had me thinking that Ezekiel may have had another trade was a Court document that I read some time ago. It indicated that he had been fined 2,200 cedar shingles for not paying his church fees. The style of shake/shingle in use at this time was usually much larger than what we are used to today. Often with more than a square foot to the weather. To have this large quantity at hand would indicate to me that he had an unusually large house or barn for the period or that he was in the business of making them. I have been trying to locate a letter written to my Great Grandfather by another family researcher and dated 1909. The letter describes a walk taken by the writer to visit the site of Ezekiel's house in Amesbury. He clearly describes landmarks, road names and people spoken to on the walk. He finally arrives at what he refers to as the "sacred cellar hole". It will be interesting to follow his path with with a map from that time. I met a woman years back in Amesbury who was convinced that the site had been eaten up by a gravel pit. I am in the process of scanning my mountains of research work so hopefully I will find the letter soon. My line is Ezekiel, Ezekiel, Thomas, David, Thomas, Amos Henry, George, Edmund, Albert, Samuel, Samuel.